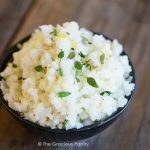 This clean eating lemon thyme cauliflower rice is the perfect low carb side dish for substituting rice! As many of you know, for a while I was eating low carb alongside clean eating. But one of the things I’ve discovered was that there are some things in the low carb food world that I enjoy far more than their higher carb counterparts. Even now that I’m not longer eating low carb. Riced cauliflower is one of these items. I prefer it far and above any type of regular rice. 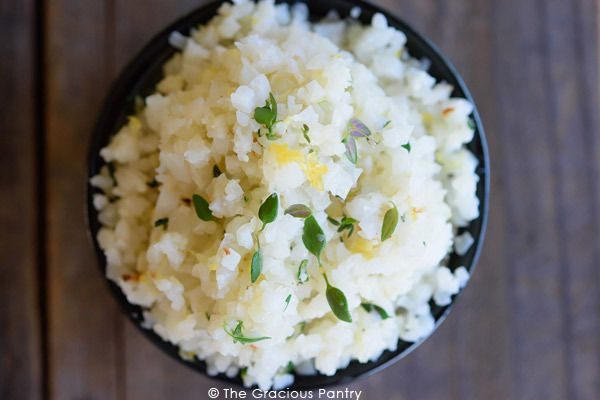 This Clean Eating Lemon Thyme Cauliflower Rice recipe is a perfect example of why I love it so much. It has more flavor overall, and you don’t have to go crazy with the spices because it seasons really easily. Far more so than regular or brown rice. Learning to eat lower carb has been an adventure to say the least. I’ve had my ups and downs (literally), but overall, it’s been really beneficial. The body just doesn’t need a ton of carbs to be healthy. At least not according to the research I’ve done. So for now, I’m enjoying the low carb culinary adventure, particularly with anything having to do with rice. If you want, you can substitute brown rice for the cauliflower however. 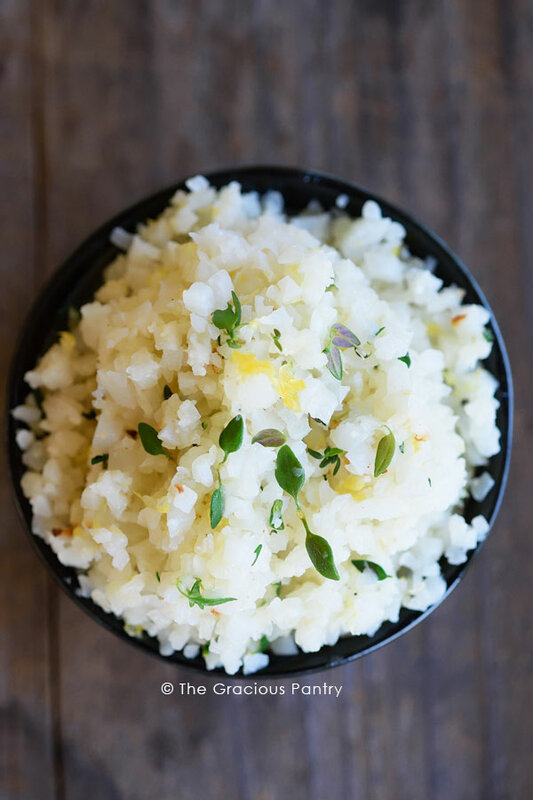 Although with brown rice, you may want to consider doubling the lemon, thyme and garlic as rice really does require more flavoring. But either way, this make a delicious side dish! Enjoy! 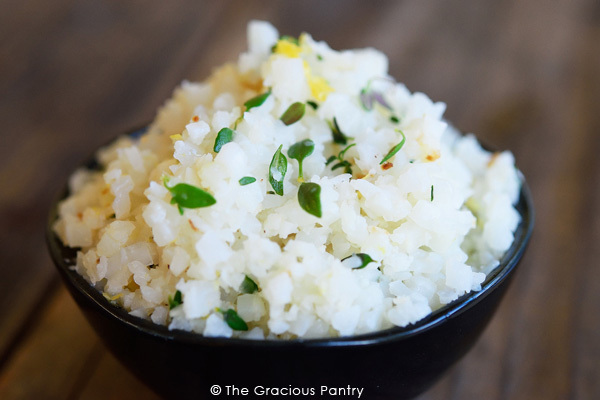 Want to enjoy rice without the carbs? 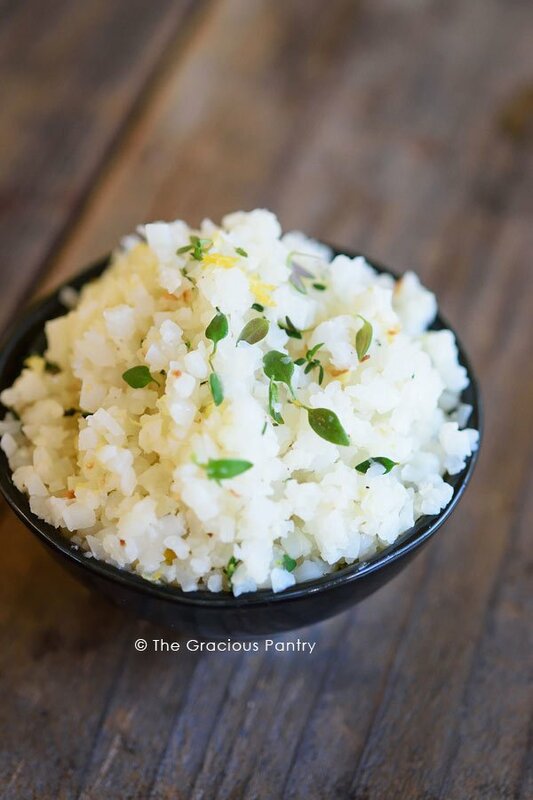 Give this delicious cauli-rice a try! Warm the oil in a medium to large skillet. Add the cauliflower and garlic. Stir until cooked to your liking. Turn off heat and immediately stir in the thyme, lemon juice and lemon zest. Season with salt and pepper to taste. Cool slightly and serve.